Chances are, if you are reading this, critical data is inaccessible or accidentally deleted from your computer or the flash drive from your digital camera or camcorder. If by chance it isn't, please take the time to consider a backup solution while the best backup solutions are possible. Drives will eventually fail, so if you haven't yet implemented a backup system, think about it. 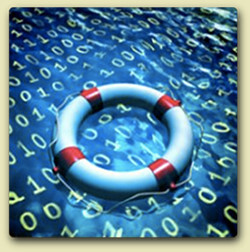 If you do need data recovery, don't despair. First, stop using the computer or the flash drive immediately. Second, call 308-2878 now, and let us see what we can do to get the files back for you. We’ve recovered from all types of deleted, corrupt, missing, or inaccessible data loss quickly and securely and will have you back up and running in no time. If your computer cannot read its hard disk, you might also need professional data recovery help. Messing around with a disk that has been damaged physically could result in loss of data. If the permanent loss of your files would seriously disrupt your life, then consider trusting your hard drive to a data recovery specialist. There are two basic categories of disk damage, physical damage and logical damage. You can know your disk is physically damaged if the hard drive is making any type of strange clicking or grinding noises. Logical damage means that the software on the disk has been corrupted to the point that the files are unreadable. If the hard drive or flash drive has been in a fire or suffered some other sort of physical damage, you need a data recovery specialist with a clean room to do the work, and that is a service we don't provide. But until the data is overwritten, even if the operating system is hosed, successful data recovery is still possible. The sooner you act, the better the result will be. Data recovery service times vary according to the size of the affected drive, the type of hard drive failure involved, and the amount of data stored on your device. Give us a call at 308-2878, or email us and let us see what we can do to get the files back for you.